Annaya (Agenzia Fides) - "Even with all our solidarity with the refugees, the Lebanese hope that the process to guarantee them a safe return in their Country, by setting aside the different political positions that hinder the solutions desired, will be reconsidered". 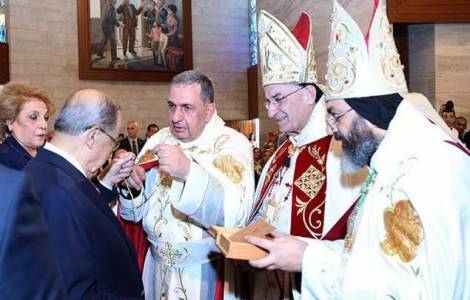 With these words Maronite Patriarch Béchara Boutros Raï directly addressed Lebanese President Michel Aoun, during the homily on the occasion of the Feast of St. Charbel, celebrated by the Primate of the Maronite Church in Saint Maron Monastery in Annaya, in the presence, among others, of Lebanon's Head of State, his wife Nadia and apostolic Nuncio, Archbishop Gabriele Caccia. Addressed to Aoun, the Patriarch expressed appreciation and encouragement for the "good intentions" pursued by the President, but focused on the worries, the fatigue and the suffering of the Lebanese people that have also been severely aggravated by the presence of "two million refugees and displaced persons on the national territory who deprive the Lebanese people of their means of subsistence, leaving them in poverty and deprivation, and pushing new generations to emigrate". In the homily, whose text was sent to Agenzia Fides, Patriarch Rai renewed the alarm also with regard to the "rampant corruption in the Country" and the "sectarian race in the cornering of public office", denouncing a policy of facts carried out that "go against the spirit of the Constitution, the National Pact and the mechanism for administrative appointments".